With this commitment, Neotrope aligns itself with CAMMO’s ongoing mission to provide military-specific music programs to help past and present service members suffering from neurological impairments such as traumatic brain injury and post-traumatic stress disorder (PTSD). As part of this in-kind grant program, Neotrope is providing public relations (PR) solutions, news dissemination (through its Send2Press® Newswire service), online advertising, and social media marketing for CAMMO. This program is intended to help raise awareness of the 501(c)(3) non-profit to traditional media, to the public, as well as potential sponsors and donors, regarding their efforts. CAMMO (Center for American Military Music Opportunities) is a 501(c)(3) non-profit organization founded in 2009 by U.S. Navy veteran Cathie Lechareas and U.S. Army veteran Victor Hurtado that believes in the healing power of music. Run by veterans for veterans and active-duty service members, CAMMO provides military-specific music programs to help past and present service members suffering from neurological impairments such as traumatic brain injury and post-traumatic stress disorder (PTSD). CAMMO also develops military and veteran artists, technicians, writers and musicians at its CAMMO centers. Through its Soundtrack to Recovery in-reach program, CAMMO brings certified music therapists, musicians and volunteers to hospital Residential Treatment Centers. And CAMMO’s Guitars Revitalizing Our Warriors Through Healing (GROWTH) program encourages positivity, motivation and hope through full-spectrum guitar and music instruction. For more information about CAMMO, visit http://www.cammomusic.org/. Since 1983 Neotrope® has delivered services to raise organization awareness including brand identity, marketing, public relations (PR), web development and ecommerce, and Last Mile SEO™ services. Neotrope is also an entertainment publishing company involved in books, music, software, and online magazines. The company, co-founded by Dr. J.L. Simmons, and Christopher Laird Simmons, has been at the forefront of many communication and technology movements for over three decades. Neotrope was an Inc. 5000 company in 2009. More information: http://Neotrope.com. 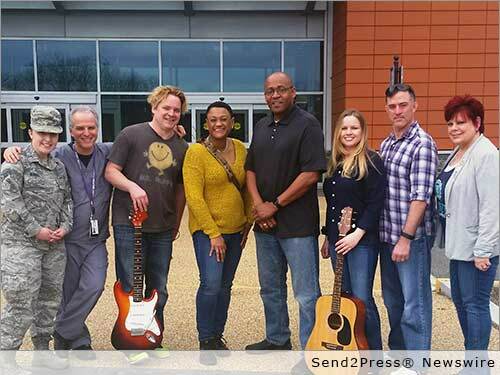 *Photo Caption: Soundtrack to Recovery team Fort Belvoir, Va.